While the polar vortex closed the doors to classes in the middle of the week, students found ways to keep themselves busy and warm as the city shut down because of the record-breaking cold. With little else to do, many students opted to stay indoors and catch up on homework or watch a new show. Junior Symphony Kleba, knowing it would be too cold outside, built a blanket fort in her room at McCabe, filling it with pillows and a T.V. before snuggling in with cups of coffee to binge-watch Netflix all day. Despite online protests to DePaul to cancel school because of the below-freezing temperatures, other students chose to brave the dangerous outdoors. Videos quickly emerged online of students running outside in nothing more than their underwear to run up and down the street, while others snapped pictures of them sunbathing in their swimsuits while relaxing on a heap of snow. A trend appeared online of many students taking a pot full of boiling hot water and throwing it into the wind, causing it to evaporate the second it hit the frigid air. The Fullerton Red Line platform during rush hour on Jan. 30. Temperatures reaching -23 degrees left public transit services empty of passengers. Other students tried to be productive with their days off. Freshman Kayla Kraft and her roommate Emi Hansen opted to bundle up and brave the freezing temperatures because classes had been canceled and make their way to the beach, where a few other people had also chosen to go. The polar vortex created quite a sight for anyone who looked at Lake Michigan. Steam pooled off of the lake once the water interacted with the freezing cold air, creating a hauntingly beautiful image. Before the cold snap hit, landlords across the city sent out warnings about how to best prepare for the cold, including instructions to leave pipes running and check on furnaces regularly. Chicagoans took to the grocery stores earlier this week, stockpiling all of the essentials and leaving many shelves bare. The city prepared for historically low temperatures without missing a beat. “This is a historic cold, but Chicagoans are historically strong,” Mayor Rahm Emanuel said in a press conference on Wednesday night. Once the temperatures dropped, a good majority of the city went into shutdown mode. Many businesses closed their doors on Wednesday, mainly because of how dangerous the conditions were and not wanting to risk the health of their employees during the brutal cold snap. “I had to return some things I bought but found out all the stores on Michigan Avenue were closed,” said sophomore FrancesMary Apostolos. Ride-hailing and delivery service prices skyrocketed due to the lack of drivers who wanted to leave the comfort of their heated housing to make a few extra dollars, but many who did were rewarded with large tips. However, for those were vulnerable to the Arctic chill throughout the city, Uber and Lyft were offering free rides to one of the city’s 270 warming shelters throughout the city until Thursday night to help Chicagoans keep out of the dangerous cold. Five buses ran throughout the city providing warmth, hot chocolate and items like socks to homeless people who chose not to stay in the warming shelters overnight. South Shore and Metra Electric trains went out of service in the middle of the week after cold temperatures and a train derailment that took down power lines. The trains were still out of service into Friday afternoon. Due to the Metra closures, CTA’s Red Line and some bus routes were accepting Metra passes to help commuters navigate through the city. 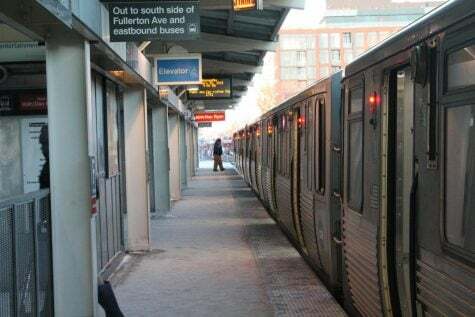 Public transportation also moved at reduced speeds when an electrical fire broke out on a set of tracks, effectively closing down the Blue Line between the LaSalle and Damen stations for over an hour on Thursday. On Friday, the Blue Line suffered another set of delays after a third trail derailment put a halt to the morning commute. CTA workers who braved the cold in order to get to work were rewarded with pizza from New York City’s transit workers at the MTA on Wednesday, as well as breakfast sandwiches and hashbrowns from Emanuel on Thursday. Amtrak services were restored on Friday after having to shut down due to weather and technical issues. Both of the city’s airports reported 1,700 canceled flights between 3 p.m. on Wednesday and 3 p.m. on Thursday. Drivers within Chicago also faced a number of issues while commuting throughout the city. Cars suffered from weather-related issues, dead batteries and tire malfunctions. Motor vehicle service company AAA reported a 460 percent increase in roadside assistant calls on Thursday, as compared to the same time last year. Canceled flights, broken down cars and train derailments may have plagued the city, but officials said that no cold-related deaths occurred in Chicago or the surrounding areas. Despite the harsh temperatures outside, students managed to stay safe and warm during the cold snap, proving that Chicagoans can brave even the worst that winter has to offer.